India Club – Lounge Bar. Hotel Strand Continental. 143 Strand, London WC2R 1JA. Please come and join us in celebrating the publication of our book ‘Celebrity, Aspiration and Contemporary Youth: Education and Inequality in an Era of Austerity’ by Heather Mendick, Kim Allen Laura Harvey, and Aisha Ahmad. The book is the culmination of years of collaborative work by the CelebYouth team. The book is published in February by Bloomsbury Press. We will be celebrating its publication in a wonderful venue in central London – the India Club. We held some of our project meeting lunches here so it has special significance for us. There will be wine, dosa, samosas and more! There is a Facebook event for the launch here: https://www.facebook.com/events/1996341107269986/?active_tab=about. Kim spoke about the project at a one-day symposium at Middlesex University called ‘ Feeling Supported: School practices, social networks and young people’s transitions’. The event was organised by researchers involved in a large FP7 project on young people at risk of early school leaving (RESL.eu). The day included presentations from researchers in the sociology of education and youth studies and considered the role of support networks, resources and relationships to young people’s transitions and imagined futures. Entitled ‘Thinking with and through celebrity: The role of celebrity as a cultural resource in young people’s post-16 transitions and aspirations’ Kim’s paper presented some of the findings from the project contextualised within the arguments presented in our forthcoming book. You can view her slides here. Heather spoke about the project at two sessions designed to support people in bidding for external funding at Keele University in October and at Oxford Brookes University in November. Concentrating on the mediation of the Kate (Duchess of Cambridge) and Prince Harry, this paper examines how Royal celebrity functions within the current moment of austerity Britain. Understanding austerity as having a distinct discursive, aesthetic and moral register, the paper identifies how themes and tropes of ordinariness, thrift, hard work, social mobility and nostalgia play out in the mediation of Harry and Kate. It explores how these two Royals come to figure in ways that serve to legitimate and justify the immense wealth and privilege of the institution of the Royal Family in the context of growing inequality and declining social mobility. To do this, it uses textual analysis of the media representation of Harry and Kate along with data from interviews with 148 young people (aged 14-17) to illuminate both celebrity and austerity as spaces of contestation and struggle. By unpicking what symbolic work these figures do in neoliberal austerity Britain, the paper seeks to extend and update earlier analysis of the Royal Family. 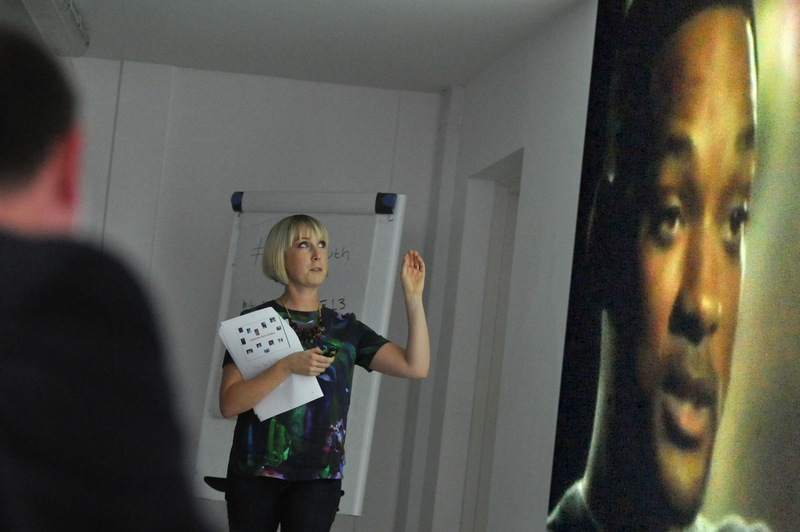 Heather gave a seminar are Umeå University entitled ‘Young people, hard work and celebrity culture in England‘. In this presentation, Heather showed how, how contrary to the views of UK politicians and commentators, young people value and invest in ‘hard work’. She argued that we should not simply celebrate this investment in hard work. Young people’s discussions of celebrity culture show that, while ‘hard work’ opens up successful subjectivities to previously excluded groups, it reproduces neoliberal meritocratic discourses and class and gender distinctions. Kim gave a presentation about Royal Celebrity and Austerity at the workshop ‘Celebrity, Prestige and the Cultural Field‘ at the University of Portsmouth. This workshop focused on relational aspects of celebrity culture with reference to debates about field analysis, cultural value (and valuelessness), DIY celebrity and spoiled identity, shame and disgust, autonomy and heteronomy, classed and gendered representations, good and bad taste, privilege in an era of austerity, boundary crossings and successful/unsuccessful attempts to carry prestige from one cultural field to another. Heather gave a presentation at Sheffield Hallam University entitled: Young people’s narratives of success within austere meritocracy. In this talk she looked at patterns of ‘success’ and ‘failure’ in young people’s plans for the future drawing on the CelebYouth data. Her analysis looked both at what participants perceived as success and at how these ideas fit with dominant discourses of successful selfhood within an ‘austere meritocracy’, a society in which a belief in meritocracy persists despite growing inequalities and a post-crash landscape where the financial supports for social mobility have been cut. She began by looking at the figure of the entrepreneurial self, who is future-oriented, flexible and resourceful. Such selves are able to overcome all obstacles. This figure is central to austere meritocracy and young people’s talk often drew on it. Next she offered a contrasting figure, one whose concern is with ‘getting by’. Within austere meritocracy this figure is often denigrated as having low aspirations and yet is a product of the current economic and labour market conditions. Finally she offered case studies of young people who would be read as ‘failures’ in relation to government policy on aspiration. Heather and Akile dida talk at the British Science Association about the findings and also the new Knowledge Transfer work. Heather presented a paper at Uppsala University, Sweden, looking at young people’s aspirations within neoliberalism. Celebrity culture occupies a contradictory space in contemporary political rhetoric, particularly in relation to young people’s aspirations. While celebrities such as Olympic athletes appear as potential ‘role models’, celebrity culture is often derided as eroding ambition and encouraging the ‘wrong’ kinds of dreams, behaviours and desires. While celebrity culture is regularly cited in debates about the ‘sexualisation’ of girls, it also features in discussions about ‘at risk boys’, with Diane Abbot MP recently stating that young men were trapped by a ‘Jay-Z model of hyper-masculine, hyper consumption’. Engaging with interview data from an ESRC-funded study of ‘The role of celebrity in young people’s classed and gendered aspirations’, this paper considers how race, class and gender intersect to police the boundaries of aspirational selfhood. The research included group and individual interviews with young men and women (aged 14-17) in six schools in England; and textual case studies of celebrities’ media representation. We draw in particular on interview data from ‘imagination exercises’ where we asked young people to imagine celebrities attending their school, exploring their views on the differences and similarities between celebrities and their own lives and imagined futures. We will explore how evaluations of cultural taste circulate in powerfully affective ways in young people’s engagement with celebrity culture, drawing boundaries around different forms of masculinities and gendered futures. In doing so we will argue that celebrity culture provides a rich lens through which to unpick the classed and racialised constructions of ‘aspirational’, ‘authorized’ and ‘risky’ masculinities within current times. Heather spoke at A New Direction’s Cultural Capital Conference in London. She was part of a panel alongside Eleonora Belfiore and Lisa Mckenzie. You can watch her presentation below and read more about the conference and watch all the presentations here. Heather and Laura presented a seminar about the study at the University of East London, between 5 and 6pm. 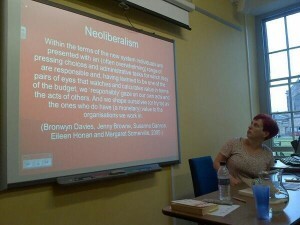 The seminar was entitled ‘Narratives of Aspirations in Neoliberalism‘. In this presentation they explored the stories that young people tell about their aspirations and imagined futures at a time of deepening social inequalities. They examined how neoliberal discourses of individualism, self-responsibility and enterprise feature in young people’s everyday talk about ‘success’ and ‘failure’. This paper explored the stories that young people tell about their aspirations and imagined futures at a time of deepening inequalities, welfare reform and increasing poverty levels affecting young lives. Specifically, they examined how neoliberal discourses of individualism, self-responsibility and enterprise feature in young people’s everyday talk about ‘success’ and ‘failure’. Their paper highlights the pervasiveness of neoliberal discourses of individualism, meritocracy and hard work within young people’s accounts. However, they complicate claims that these reflect a simple adoption of neoliberal ideology. They explore the powerfully emotional nature of discourses of self-reliance and ‘striving’ in the young people’s narratives, considering how these are entangled with individual and family biographies and entwined with practices of ‘resistance’. In doing so, they seek to emphasise the contradictions, complexities, ambivalences and ambiguities within neoliberalism as it works within and through the messiness of everyday practices. Heather spoke alongside Michele Paule in a seminar at Oxford Brookes university on Youth and Schooling: Turning on Success. The seminar was the first of a seminar series entitled Success in the Neoliberal Life Cycle: Alternative perspectives on a dominant paradigm. Her talk was called ‘Poking holes in the toxic positivity of contemporary life‘. You can read a blog by Heather about her talk on the series website. You can also read a blog by Michele about her talk: ‘Turning on Success’. This paper explores the stories that young people tell about their aspirations and imagined futures at a time of deepening inequalities in education and the labour market, and rising uncertainty and precarity characterising young lives. Specifically, we examine how neoliberal discourses of individualism, self-responsibility and enterprise feature in young people’s everyday talk about ‘success’ and ‘failure’. Our paper highlights the pervasiveness of neoliberal discourses of individualism and meritocracy. At a time when politicians decry a ‘poverty of aspirations’ among British youth, we found that the young people we spoke with had many dreams, from hopes for family and friendship, to careers and travel. Our paper takes a critical lens on how young people see themselves as agents in achieving those dreams, arguing that narratives of self-discipline and hard work ran through the data, while questions of structural inequality and material barriers to their imagined future lives were very often absent. We explore the powerful emotional nature of such discourses of self-reliance and ‘striving’ in the young people’s accounts, exploring their relationship to individual and family biographies, as well as contemporary stories in celebrity culture. Situating our analysis in the wider context of economic crisis, high youth unemployment and rhetorics of austerity, we critically reflect on what these stories open up and close down for young people as they transition into adulthood. We held our End of Award Event on 10th-11th July. Here we discussed the contributions of the study to the three fields of education, sociology and media and cultural studies. You can read more and listen to the talks here. At a time when widening inequality has re-emerged as critical political issue, it is important to explore the significance that people place on questions of inequality in their day to day lives. But what shapes everyday ‘views’ or framings of inequalities? We have a detailed picture of how inequality impacts people’s lives, but a weaker sense of how people perceive or make sense of issues of inequality. This, the second of two workshops considered the diverse subjectivities of inequality, explored how inequalities are made visible or invisible through ordinary social processes, and examined what provokes varying articulations of inequality in the everyday. We took part in two panels at the international Celebrity Studies Conference in London. In this paper I will explore young people’s engagements with what I call ‘celebrity geeks’ in relation to their own identities and aspirations. This term refers to those people who have acquired ‘celebrity status’ via their business and entrepreneurial activities in the realm of technology. They are epitomised by Bill Gates, but also include people like Twitter creator Jack Dorsey and gamers such as KSI who have achieved a global profile through YouTube. These celebrities occupy a complex position within education in that some of them are used within the formal curriculum and by national bodies to promote particular careers to young people. However, their reach and value to young people goes beyond this, as they feature directly and indirectly within young people’s online and offline consumption of popular culture. The paper comes out of an ongoing two year ESRC-funded study of ‘The role of celebrity in young people’s classed and gendered aspirations’ and carried out jointly with Dr Kim Allen and Dr Laura Harvey. I will draw on analyses of 24 group interviews and 51 individual interviews with young people in six schools in England alongside data drawn from a textual case study of Bill Gates’ media representation. I will argue that these celebrity geeks function as ‘worthy’ celebrities within young people’s talk and media texts, in distinction from ‘unworthy’ celebrities. Worthy celebrities are constructed as inspirational figures and good role models because they are seen to have acquired their status via hard work and to produce something of value. They are opposed to unworthy celebrities, such as Katie Price and Kim Kardashian, who are constructed as ‘famous for nothing’. Within formal education these oppositions legitimate some career pathways and people and devalue others. In particular, the dominance of white, middle-class and masculine bodies pursuing entrepreneurial and business-related careers, limits the resources available for young people in imagining their own futures. Many academics are turning to the Slow Movement to call for a reduction in the pace of teaching and research. While welcoming ‘slow’ as a disruption to discourses of neoliberal productivity, we will suggest that it is ultimately conservative, leaving in place a classed, gendered and raced conception of the academy. One of the ways that neoliberalism is playing out within universities is to accelerate the pace of academic work, with increases demanded in research impact, number of publications, external funding, speed of doctoral completions, the efficiency with which work is returned to students, and so on. Many have drawn on the Slow Movement to call for a reduction in the pace of teaching and research, suggesting that this leads to ‘better’ scholarship. In this paper, we will draw on our experiences on an Economic and Social Research Council funded study of celebrity and youth aspirations to explore what difference ‘speed’ makes to the process and findings of qualitative inquiry. While welcoming ‘slow’ as a disruption to discourses of neoliberal productivity, we will suggest that it is ultimately conservative, leaving in place a classed, gendered and raced conception of the academy and failing to challenge dominant constructions of knowledge and progress. Laura presented work from the project in a seminar the Centre for Innovation and Research in Childhood and Youth (CIRCY) at the University of Sussex. The title was: “He sounds girly”: Disgust, humour and the construction of young masculinities in celebrity talk. You can view a video of the talk here. Kim gave a seminar on celebrity motherhood and narratives of austerity as part of the Lancaster Department of Education’s seminar series. The paper is titled ‘”Disgusting celebrities”: Celebrity motherhood and the cultural politics of austerity’ . In this seminar, Kim presented emerging thinking from the project to explore how the cultural and gender politics of austerity play out through and on the celebrity maternal body. Drawing on textual analysis of mediated representations of celebrity pregnancy and motherhood, public responses to this, as well as interview data with young people (aged 14-17) about celebrity culture, she argued that a feminist and class analysis of celebrity motherhood allows us to identify and unpick the cultural scripts of femininity which characterise the present conjecture of austerity. As ‘exemplary’ mothers and cautionary tales respectively, Kim showed how Kate Middleton (Duchess of Cambridge), Kim Kardashian and Katie Price become vessels for (new and old) anxieties and fantasies around femininity, fertility, family, aspiration and class. Representing the symbolic fantasy figures and folk devils of austerity – the frugal ‘housewife citizen’ (Biressi and Nunn, 2013) and ‘scrounger’/ ‘welfare queen’ (Hancock 2004) – Kim will argue that these celebrity mothers operate as figurative props that work in the service of particular regulatory norms and ideals. Mobilising an aesthetic and set of narratives that are distinctive to austerity, these figures of mediated celebrity maternity coincide and collude with Western states’ attack on welfare and accompanying shift towards deeply conservative ideologies of the family and gender relations. Drawing on Imogen Tyler’s (2013) framework of social abjection and disgust and Angela McRobbie’s notion of ‘visual media governmentality’ (2013), Kim demonstrated how the celebrity maternal body is a central terrain upon which public narratives of austerity and their accompanying emergent subject positions are secured but also attend to the ‘cracks’ within which these are resisted and reworked. Kim, Heather and Laura gave a paper at the the Brunel Education Seminar Series, 12 – 1pm, entitled: ‘‘Jennifer Lawrence always seems like someone who’s just like us’: Young people, celebrity talk and inequality’. Drawing on group and individual interview data with young people aged 14-17, they discussed how young people’s talk about celebrity serves a social function. They argued that, in comparing their lives with those of the rich and famous, young people are making sense of the massive disparity between the two, replacing envy with pleasure in being ‘ordinary’, and thus naturalising social inequalities. The paper builds on the discursive work of Michael Billig (1992) and Maggie MacLure (2003). Seminar at the Centre for Identities and Social Justice, Goldsmith’s, London. The Centre for Identities and Social Justice aims to draw together staff and postgraduate students who are interested in researching the ways that education relates to issues of inequality. Topics currently being researched by members of the group include the ways that beginning teachers deal with racism in their practice, girls and physical education, the workings of permanent exclusion and the intersections of ‘race’, gender and class in reality TV. In this seminar Laura and Heather discussed how young people’s talk about celebrity culture serves a social function. In comparing their lives with those of the rich and famous, young people are making sense of the massive disparity between the two, replacing envy with pleasure in being ‘ordinary’, and thus naturalising social inequalities. The paper builds on the work of Michael Billig (1992) and Maggie MacLure (2003). Laura presented the research at the Media Magazine Student Conference on ‘Real world research: young people’s aspirations and celebrity culture’. The conference is for students studying Media and Film Studies AS and A2, BTEC and Diploma Level 3 and took place at the Institute of Education. You can see her presentation here. Heather presented alongside another research project on young people at the Media Education Association Conference at BFI Southbank London. BERA “Education, Youth Poverty and Social Class” one day conference, Kingston University. Kim gave a keynote paper at this one day conference organised by the BERA Youth SIG and Social Justice SIG. This event brought together academics, professionals and practitioners in the fields of education and youth studies, to explore the possibilities of education with respect to the pursuit of social justice in the context of a depressed economy and disrupted policy narratives of education. The event sought to provide opportunities to discuss practical and ethical responses to the complex question of youth and the problems of transition from youth to adulthood at a time when education and support services are being reformed and withdrawn. In her paper, Kim drew on emerging findings from the study to discuss contemporary vocabularies of injustice and how young people navigate, conceptualise and live out notions of aspiration, success and opportunity in austere and unequal times. Kim has written a blog post on the conference website. You can read this here. You can find a copy of her powerpoint here. This workshop at the CDI annual conference for careers professionals, sought to enable delegates to develop professional practice in careers education by engaging with emerging findings from our research. We shared data from the project to think about how young people use celebrity culture to imagine their futures; and discussed practical ways to engage with celebrity in careers work. Heather drew on the thinking that went into her post on Online Communication in the Age of Fast Academia when she spoke at an event on the SLOW University, at Durham University. Her title was ‘Academia Through the Looking Glass‘. Here’s the powerpoint for Heather’s Slow University Presentation. Below is a photograph of the seminar taken by Professor Maggie O’Neill who organised the event. BSA Youth Sexualities conference, Durham University. In this paper, Laura and Kim presented on the role of celebrity as a site in which performances of sexualities and gender are governed, legitimised, negotiated and resisted, taking Canadian pop star Justin Bieber as a key site for this. Unpicking young men’s talk about male celebrities (and their ‘fans’), we identify a strong adherence to hegemonic masculinities (Connell 1987) in which normative masculinities and gender were regulated in group talk through homophobic and transphobic discourses. We also draw attention to moments of cross-gender identification with Bieber, exploring the discursive work required for participants to intelligibly claim such positions. Our paper draws on these complicated moments of collective identity construction and regulation to critically interrogate arguments for ‘inclusive masculinities’ leading to a ‘declining significance of homophobia’ (Anderson 2009; McCormack 2012) in young peoples’ lives. We argue that the complexity, contestation and ambivalence in young people’s talk about celebrity provides a useful window through which to examine how young people manage their own (and others’) sexual identities within the contemporary. You can find a copy of the slides from our presentation here. We hope to write a blog about this soon and are developing this paper for publication. We held an interim Workshop at which we discussed our findings with people who work with young people. You can read more about this and view our presentations via YouTube here. 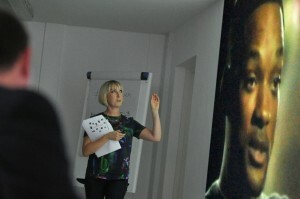 The photograph below shows Kim talking about Will Smith at the event and was taken by Brunel’s Sally Trussler. Heather was the keynote speaker at Education and Learning: Sociological Perspectives at the University of Surrey. This one-day conference, supported by the British Sociological Association’s Education Study Group, showcased the diverse and innovative range of research that is currently being conducted within the Sociology of Education. Heather’s talk was called Stars in their eyes? Celebrity, Youth and Sociology of Education. In it she used emerging findings from this study to open up a discussion about the responsibilities and possibilities for sociologists of education to intervene in ‘non-academic’ debates about youth, aspiration and education policy. You can read a blog version of Heather’s keynote. The CelebYouth team organised a keynote symposium exploring young people’s imagined futures for the upcoming British Educational Research Association conference. We presented on our research alongside Professor Graham Crow from the University of Edinburgh, who talked about the Living and Working on Sheppey Project, and Professor Louise Archer from King’s College London, who discussed the ASPIRES project. Professor Becky Francis, one of our advisory board members, acted as a generous and perceptive discussant. BERA filmed this symposium and you can watch this below. Kim, Heather and Laura spoke at this inaugural event for the BSA’s Digital Sociology Group. This event brought together a diverse range of speakers who, in a variety of ways, work within the nascent field of digital sociology. Rather than proceed from a substantive account of what digital sociology is or could be, this event sought to address the question ‘what is digital sociology?’ through an open and informal exploration of a broad range of exciting work being undertaken by sociologists in the UK which could, in the broadest sense of the term, be characterised as ‘digital’. In casting a spotlight on these projects in such a way the event initiated an ongoing dialogue about the continuities and discontinuities between these emergent strands of digital activity, as well as the broader methodological and disciplinary questions which they pose. We have written about the event in four blog posts. The first of these four can be found here. Laura took part in a panel discussion as part of East London Fawcett society’s Heartbreak Launderette campaign, which explored celebrity break up culture and the portrayal of female role models in the media, and the impact of this on women and girls. The CelebYouth team facilitated a workshop at the International Gender and Education conference at the London South Bank University in which participants explored different approaches to affect, using extracts of data from our focus group interviews. You can read Kim’s report of the workshop here. They repeated this event in an extended format later in the year in July for the Class-Gender-Media Meetup. Laura participated in TeachMeet, an event organised by the Media Education Association, in which researchers and teachers shared their experiences with 7 minute presentations and a discussion. You can see her slides here. Heather took part in a panel discussion on the Age of Celebrity at the South Bank Centre, backed by a panoramic view of London. As well as discussing emerging findings from the CelebYouth study, she answered questions on the impact of the Olympics on celebrity culture, the representation of femininity in popular culture and how social class inequalities are reproduced in our responses to celebrity. She shared her admiration for Jade Goody and her love of Big Brother. The panel was chaired by Bryony Kimmings a performance artist who is currently working on a show ‘Credible Likeable Superstar Role Model’ that seeks to seeks to promote a non-conventional character as a role model for young people. Bryony had created a diverse panel. As well as Heather, it included: Jess Cox and Lilinaz Evans, teenage feminists and editors of their own blog Jellypop; Katie Bell, Commercial Director of Star Doll, the world’s largest online fashion and dress-up games community; Melanie Kennedy, researcher of tween popular culture from the University of East Anglia; and, Miquita Oliver, British television presenter and radio personality. Heather was particularly thrilled to sit on the same panel as Miquita who she watched on Sunday mornings for several years when she co-hosted Popworld. Here’s a powerpoint for the presentation Kim gave as part of the ESRI seminar series at Manchester Metropolitan University where she discussed the background to the project and shared some emerging findings. James Duggan of ESRI wrote a blog about the seminar, here. ‘X-Factor Culture Fuelled the UK Riots': Intervening into debates on celebrity and youth aspirations. Heather gave our first presentation about the project at Brunel University’s Research Group for Problematised Consumption and Identity. Here’s the powerpoint.